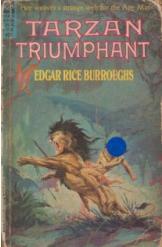 Tarzan Triumphant Edgar Rice Burroughs Sci Fi. A new party of explorers venture into the dark rainforests of Central Africa on a vital mission. Their only hope for success, and for survival, lies with Tarzan, the lord of the jungle. Part of the Tarzan series.